I have three more days left in my poem-a-day project for February. I am loving the prompts by the wry and witty Molly Fisk, loving the other poets in this online poetry group, and loving my poems and every minute spent writing them. But here's the rub: I love them so much that once I've written my poem for the day and posted it to the group website, I'm so delighted with my poem that I have to go read it over a few dozen times, occasionally tinkering with it a bit, pruning a word here, adjusting a line break there, but mostly just admiring it on the page. And then I'm so pleased with myself that I find I have absolutely zero desire to accomplish anything else. After all, I WROTE A POEM TODAY! What more could the universe expect from me? Which would be fine except that I do have a class I'm teaching, students I'm advising, writers I'm mentoring, an article I'm supposed to be revising. But - but - but - I WROTE A POEM TODAY! Isn't that enough? So it's good that the short month of February is coming to an end, and that I'll have to find new ways of generating creative joy for myself in March. But for now, I'll just say: hooray for poetry! And for the chance to write it! Here's one more poem because I can't resist. Prose is in my future. But today, and tomorrow, and two days after that: poetry. . .
forehead! That slump of your shoulders! it was you, it was you." Last week there were not one but two huge book-related events here in Denver. CCIRA (the Colorado Council of the International Reading Association) had its enormous annual conference down at the Denver Tech Center's Marriott Hotel, and ALA (the American Library Association) had its gigantic mid-winter conference this year at the Denver Convention Center, especially exciting as the ALA conferences move around from city to city. I attended events at both. - a cocktail reception at the Denver Center for the Performing Arts hosted by my new publisher, Holiday House, for the librarians attending ALA.
- another cocktail party jointly hosted by YALSA (the Young Adults Library Services Association of ALA) and SCBWI (the Society of Children's Book Writers and Illustrators) held at a bar/restaurant with the adorable name of The Greedy Hamster. On Sunday: lunch with my brilliant editor, Margaret Ferguson, followed by a blissful couple of hours roaming past the overwhelming amount of publisher booths in the convention exhibit hall. It was exhilarating and exhausting (also terrifying because it snowed both Friday and Saturday, and I am the wimpiest of wimpy babies when it comes to driving in snow, after totaling my car on a slushy stretch of road a year ago). But mainly I loved every minute of it. I loved sharing my books with teachers at CCIRA and schmoozing with hilariously funny librarians at the elegant Holiday House reception. I loved connecting with another group of terrific librarians at the Greedy Hamster event. It was magical to have so much time to talk intimately with my editor. 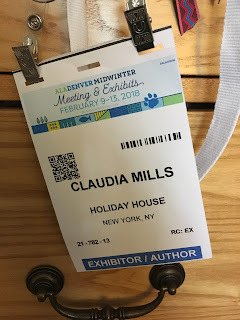 And as I wandered up and down the convention center exhibits, all I could think about was how much I love the world of books for young readers, and all the people - authors, illustrators, editors, teachers, librarians - in it. I also realized that if I'm going to stay in this world - and BELONG in this world - I have to keep on contributing to this world. If I want to be a player in this magical playground, I have to show up to play. Lately I've been finding myself losing interest not in writing, never in writing, but in publishing what I write. After keeping my commitment to myself for 2017 to submit something somewhere every single month, I'm sort of "over" submitting things. This year I'm loving above all writing poems just for me, or for a few friends, just for the joy of it. It matters less and less to me to see a book in a bookstore with my name on the cover. But my time at CCIRA and ALA reminded me that if I want to be truly a part of this world I love so much, I have to keep on being willing not only to write, but to share what I've written with editors, teachers, librarians, and most of all, children. I love this world. I love being a part of it. It's true that most of all I just want to have creative joy in my life, but I also love being part of a creative tribe. So I'm going to do what I can to keep my place in mine. Back in January, when the fervor of ambition for the new year was upon me, I saw on Facebook a link to a list of "11 incredible books by writers from s---hole countries" - that is, countries denigrated by our president as producing immigrants that shouldn't be welcomed here. The writers on the list were all women writers, and all but two writers I had never heard of. Politics aside, wouldn't it be a lovely project to read these books through the course of 2018? And what if I formed a little book group to read them with me? That day I ordered up as many titles as were available through the Boulder Bookstore, our premiere indie bookseller. Then I put out an invitation on Facebook asking who wanted to join me for this reading adventure. After a day or two, I had a dozen participants here in Boulder/Denver/Longmont, as well as several from around the country who wanted to join in, too. This was really going to happen! I was a bit nervous before our first meeting, as the only connection among the participants was that they were my Facebook friends, and friends from so many different parts of my life: former philosophy students from CU, fellow children's book authors, a mom whose kids knew mine in their elementary school days, a "pew mate" from church and her Brazilian friend. It all felt a bit - random, I guess. But it turned out to be wonderful. When most of the people in a book group don't know each other, when they share only a commitment to challenge themselves as readers, they come ready to spend 90 minutes actually talking about the book, enriched by their diverse experiences, and eager to fill their lives with more diversity still. At our first meeting, last night, our chosen title was Homegoing by Yaa Gyasi, born in Ghana, but raised and educated in the U.S. Her book is an ambitious interwoven narrative that traces the stories of the descendants of two sisters over half a dozen generations, one side of the family engaged in the slave industry in Ghana, the other enslaved, and then free but burdened by oppression, in America. We talked about whether we found the structure of the book satisfying or constraining, whether we found the stories unbearably depressing or celebratory of resilience in tragedy, and what the book was trying to tell readers about the way that knowledge of our own stories, even the darkest ones, can set us free. In March we'll be reading Behold the Dreamers by Imbolo Mbue of Cameroon. For April we'll switch it up by turning to a slim volume of poetry, Teaching My Mother How to Give Birth by Warsan Shire, a Kenyan-born Somali poet now based in London. Then we'll decide what to read next, perhaps something by Haitian author Edwidge Danticat, some of whose books I read in a reading group at DePauw University during my time there. My world will be bigger at the end of 2018 than it is now. Hooray for the chance to hear new voices, and to listen to them together with new friends. My chief creative-joy-achieving strategy for February has been joining an online group of poets organized by brilliant, inspirational poet Molly Fisk, who is a specialist in creative joy if anyone is. The group works like this. You sign up and pay a modest fee to cover administrative costs. Every day Molly posts a prompt (you can find the February prompts on her website, on the February 2018 tab at the bottom on the home page). Then you write a poem on that prompt - or on some other topic of your own choosing - or no poem at all. Then you post your poem on the private group website - or not. You can comment on others' poems if you feel like it - or not. The only rule is not to offer unsolicited critique - just to express appreciation. If you feel like it! The combination of structure and freedom here - the daily prompts, but the lack of coercion to produce accordingly - has been magical for me. Also, many of my fellow poets in the group are amazing - experienced, well-published poets of astonishing gifts who, like me, just thrive under Molly's gentle guidance. When I'm writing a poem for Molly, I don't need to add Cool Whip to my Swiss Miss hot chocolate, or sit in a cozy cafe, or do a single solitary thing to make the experience more special, as writing poetry is already as special as anything could be. So: first I get a half hour of joy writing my poem. Then for the rest of the day I get many flashes of joy as I go back and read my poem over and over again, with a mother's proud fondness in her cherished offspring. Here is my favorite of the poems I've written so far. Thanks for letting me share it here! their lunchboxes plead not to be forgotten. the carrot weeping at being left upon the plate. to Christopher Robin at the Enchanted Place. My granddaughter left yesterday, back to her mommy. We see her so seldom now, my son and I, since the divorce. the small spoon all by itself in the drawer.